We want the world to believe we are good Christian girls, that we say yes to God about everything, that we are great followers of Jesus and that we have learned everything we need to know about Him. Ha! Who is laughing out loud with me? What could be further from the truth? Can we all just be honest? We avoid saying yes to God because we are afraid of what He might ask of us. We are not great followers of Jesus; we are marginal at best. We lose our way, get distracted, focus on ourselves and then re-calibrate and start following again – over and over. There is so much more to know about Jesus, so much more to understand about God. Our mind just cannot comprehend who the Father, the Son and the Holy Spirit truly is/are. Scripture tells us in I Corinthians 13:12, “For now we see only a reflection as in a mirror, but then face to face. 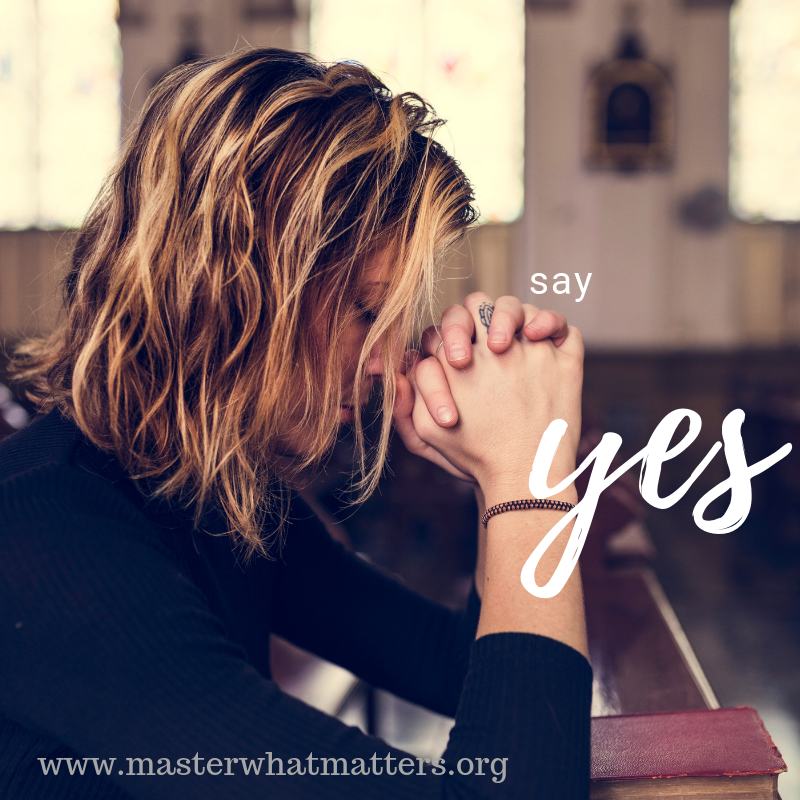 Now I know in part, but then I will know fully, as I am fully known.” Instead of making it more difficult than it should be, what if we were to truly say yes to God? Oooh, before committing we need to know what this might entail. Right? Well that is our first misstep. We want to know, we want to be in control, we want the details before making decisions. But – that doesn’t require faith, does it? The first time we said yes to God, we were on our knees repenting of our sins, inviting Jesus into our heart, accepting Him as our Savior and placing our trust in Him. But then we got up and went about our life. If we are to say yes to God, we need to go back to where it all began. Saying yes to God begins with our acknowledgment of who He is and what He has done for us. It requires a deep love for Him – loving Him with all of our heart, our soul and our mind. It must include being aware of our sin, sorrowful over it and understanding our desperate need for His grace. Apart from Him, we can do none of this. But because of Him, we can surrender. We can give up our way and instead rest on His promises, trust in His word, and focus on His faithfulness. We won’t have all the information. We won’t be able to see 5 years down the road. We will not know exactly where we are headed. But we will know that God is in control, that He loves us with an everlasting love that is greater and more complete than we could ever understand, and that He has us. No matter what, He has us. We can study His word and get to know Him and His ways more and more. Psalm 119:105 says, “Your word is a lamp for my feet and a light on my path.” Take that literally. We may be in the dark as to what God is calling us to do, but He will reveal our next step the same way a lantern will light our way on a dark night – one step at a time.